Cold stress adversely affects plant growth and development and thus limits crop productivity. Diverse plant species tolerate cold stress to a varying degree, which depends on reprogramming gene expression to modify their physiology, metabolism, and growth. Cold signal in plants is transmitted to activate CBF-dependent (C-repeat/drought-responsive element binding factor-dependent) and CBF-independent transcriptional pathway, of which CBF-dependent pathway activates CBF regulon. CBF transcription factor genes are induced by the constitutively expressed ICE1 (inducer of CBF expression 1) by binding to the CBF promoter. ICE1–CBF cold response pathway is conserved in diverse plant species. Transgenic analysis in different plant species revealed that cold tolerance can be significantly enhanced by genetic engineering CBF pathway. Posttranscriptional regulation at pre-mRNA processing and export from nucleus plays a role in cold acclimation. Small noncoding RNAs, namely micro-RNAs (miRNAs) and small interfering RNAs (siRNAs), are emerging as key players of posttranscriptional gene silencing. Cold stress-regulated miRNAs have been identified in Arabidopsis and rice. 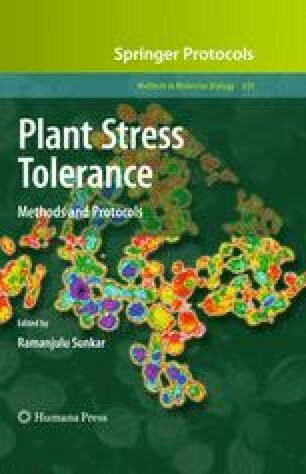 In this chapter, recent advances on cold stress signaling and tolerance are highlighted.